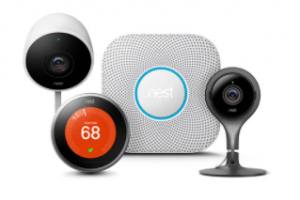 When you think of Nest, you probably think thermostats, but Nest offers a whole array of products. From thermostats that program themselves, to HD cameras that allow you to see your home on your phone, Nest products help you save energy, keep your family safe and stay connected to what’s important. Every Nest Cam plugs into power so it won’t miss a second, can send helpful notifications to your phone and is designed with an all glass lens and premium materials. See your home when you’re away from home. Alerts sent to your phone if something is up (motion sensor). HD Talk and Listen: Lets you have a seamless conversation from your smart phone to your camera. 4K sensor with HDR and intelligent imaging. Nest Cam IQ has HD Talk and Listen, which lets you have a conversation from your smartphone to your camera. Nest Cam IQ has advanced intelligence, so it can do things like tell a person from a thing and even recognize faces with NEST Aware*. High-powered LED infrared lens for clear, even night vision. Nest Cam IQ outdoor is weather proof and tamper resistant. The Nest Protect smoke alarm uses a friendly human voice that will give you an early warning, like when you’ve burnt toast. It will tell you what’s wrong and even alert your phone. Provides early warning detection for CO or smoke emergencies. Notifies you in case you’re not home. Pinpoints the emergency area in your home immediately. When you turn off your lights, look for a quick green glow. It means all your Nest products have tested themselves, the batteries are good and there won’t be any battery chirps at 2am. Lights your way: If you need a glass of milk in the middle of the night, Nest Protect lights up as you walk underneath it. Nest Hello video doorbell lets you know who’s at the door. It replaces your existing doorbell and delivers HD video and crisp images, even at night. 160-degree field of view, showing your visitors head to toe or packages left on the ground. It can tell the difference between a person and a thing, then alert you, even if a visitor doesn’t ring the bell. Nest Hello requires a wired doorbell, chime and the right transformer. A.J. Perri is a Nest Pro Installer and can help you get setup. At A.J. Perri we want our customers to have the highest quality products and technology for their homes, which is why we have partnered with Nest. If you’re interested in learning more about Nest products please reach out to us or schedule installation online today.